I decided to try some airbrushing using my shop compressor and run hose from compressor to filter and pressure regulator then on to airbrush. Gathered some parts and just realized my fittings are all NPT and the airbrush and hose is BSP! OOooo balls!! Now I need a NPT to BSP fitting. I doubt I will find that local, anyone else run into this? Unfortunately yes. I believe thats why I rolled the hose up and repacked the el cheepo air brush I inherited from my Step dad. There is a short 30” or so cloth covered hose that connects to the air source, but doesn’t fit anything I had available. I assumed it had to connect to a Freon can or something “not normal”. I figured if and when I find something I need to airbrush I’d just chop off the Odd fitting and clamp it on a barbed fitting. 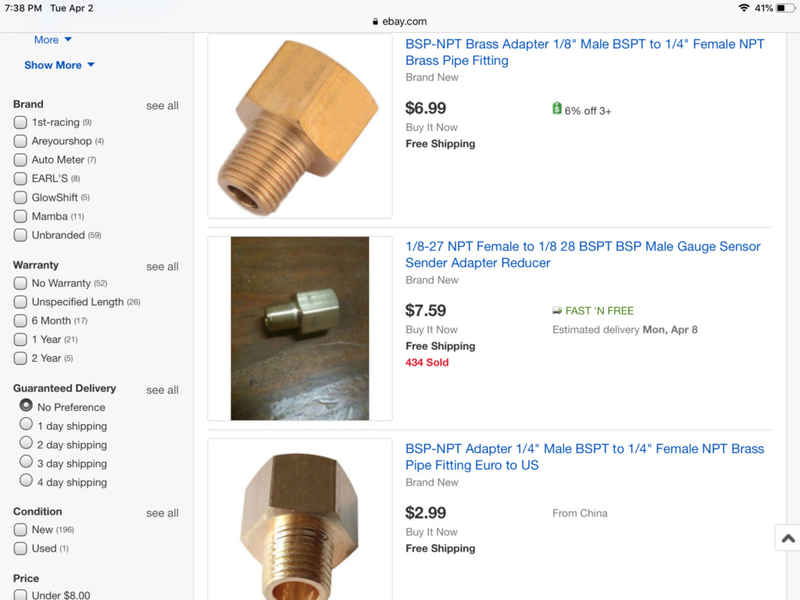 Did a quick google and found lots of BSP to BSP fittings but no NPT to BSP. I have a cheepie Harbor Freight airbrush. Never went over 32 psi to spray dope. If it comes down to it, use the tapered thread BSPT and epoxy the thing into an adapter. My motorcycle's case studs are held in with JB Weld. I doubt air at 32 psi is any harder to keep up with than those studs! 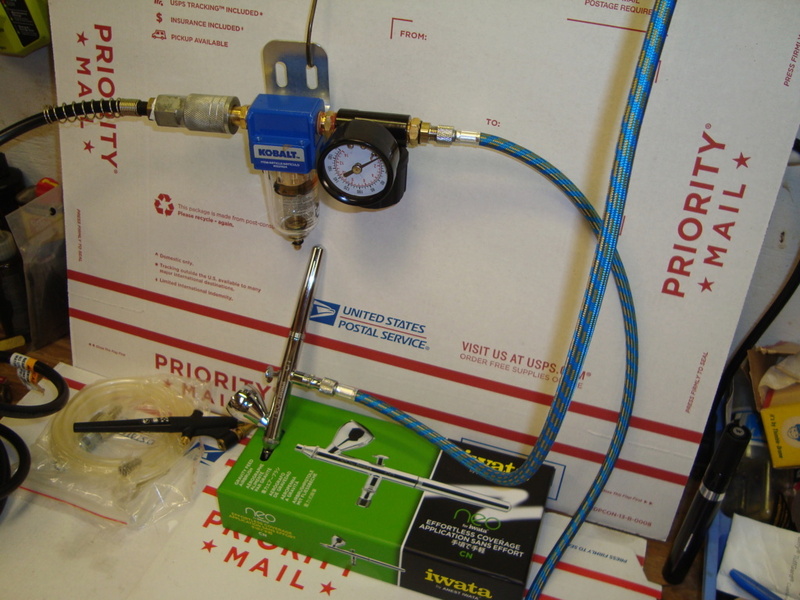 Oh, and the Harbor Freight air brush had all I needed to connect it to my Craftsman compressor. Probably some local craft store would have something. Here is just a random search that might have something? https://www.paascheairbrush.com/product-category/airbrush/airbrush-airbrush-and-sprayer-accessories/airbrush-airbrush-and-sprayer-accessories-adapters/ You would not get it by tomorrow though. 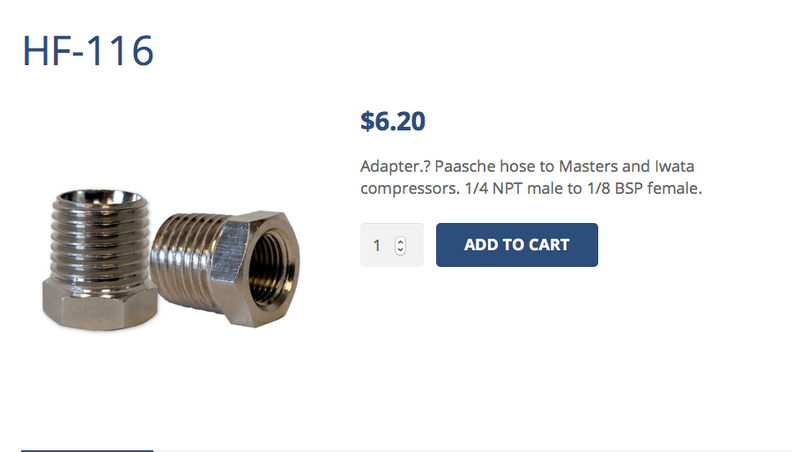 There are adapters available that the air gun hose screws into one end and the other end is the male quick connect compressor fitting. When I get home tonight I will see if I still have one I can send you. aspeed wrote: Probably some local craft store would have something. Here is just a random search that might have something? 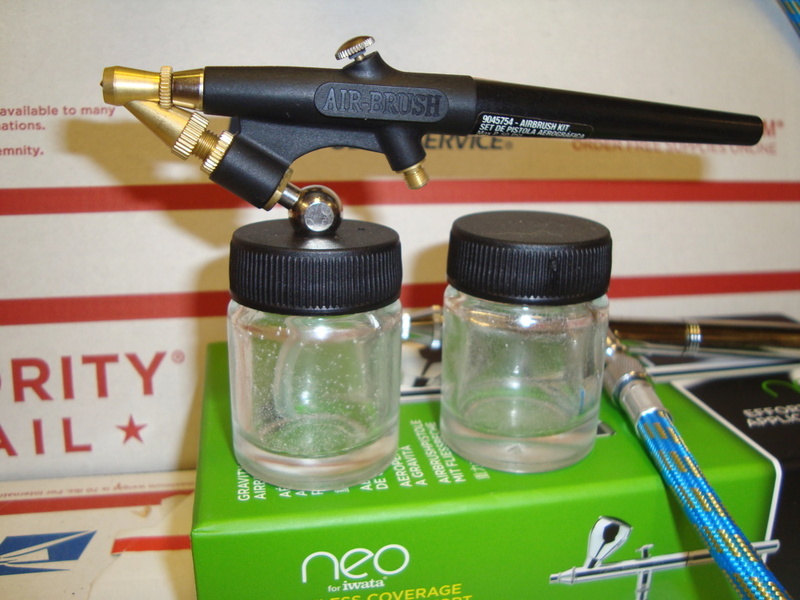 https://www.paascheairbrush.com/product-category/airbrush/airbrush-airbrush-and-sprayer-accessories/airbrush-airbrush-and-sprayer-accessories-adapters/ You would not get it by tomorrow though. 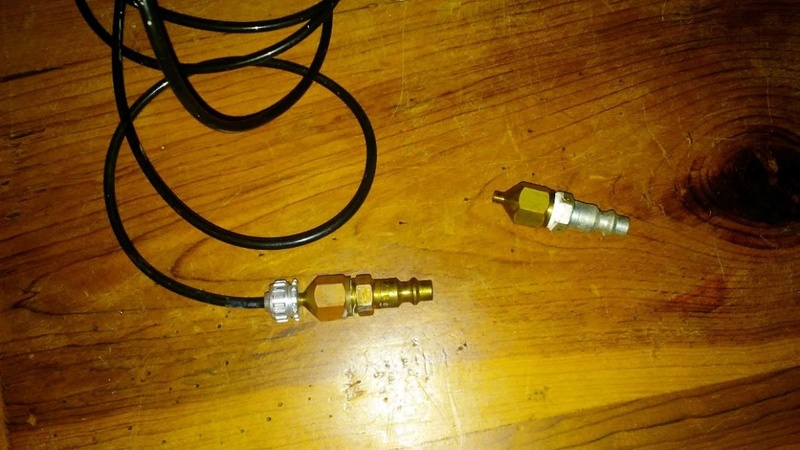 fit90 wrote: There are adapters available that the air gun hose screws into one end and the other end is the male quick connect compressor fitting. When I get home tonight I will see if I still have one I can send you. Thanks fit90, I found the part I need. Since this has been on my mind all day I dug it up and took a few pics. It is basically three parts. 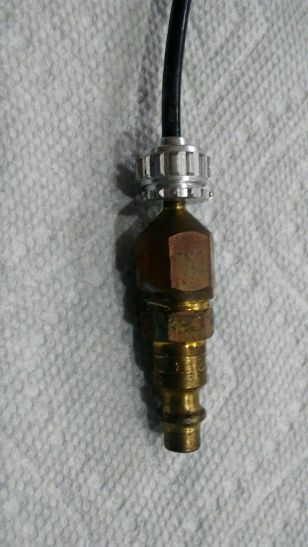 1) A regular compressed air quick male disconnect, 2) A reducer, 3) the assembly to screw the hose onto a can of compressed air. If you need it just pm me your address. It's good that this thread came up now, because last Thursday I went to Harbor freight and bought all the pieces to set up an airbrush so I can graduate from rattle cans. My new brush is a siphon style. I was disappointed they didn't have a gravity feed. I may have questions when I get around to putting some dope in it to test spray and get my pressure settings figured out. I'm using a 4 gallon Coleman compressor. I bought an additional inline filter and regulator. Got the setup blowing air today. Long coiled hose from compressor to filter and regulator then a NPT to BSP adaptor to brush hose. The BSP on the brush hose and brush are straight thread so need a O ring or gasket. Going to try to spray some Liquid Chrome on old Cox parts that lost their Chrome. Let us know how it goes. I have a little black brush like that one next to your silver one. I bought a new 6 gal. Craftsman(Porter Cable) compressor last weekend. Yes, this one looks like it will put out more paint on a larger area than the Iwata. Thats kidy like my set up , heck i run around 50# on my regulator to get an even spray with the mix 1 to 3 thinner sometimes less if you want more color / Have you had a chance to use the new one yet ? No I haven't used it yet, I have to prep the parts and figure out some kind of "tree" to hold 12+ little parts for spray. crankbndr wrote: Yes, this one looks like it will put out more paint on a larger area than the Iwata. That looks like mine, maybe an increment larger... hard to tell in te picture. I have not shot any fluid through mine yet, but I have trouble regulating the pressure. I pump the 6 gal. tank up to 180 pounds, and set the output to 80. The 5 foot long fabric covered hose is the same as yours and it's rated at a max pressure of 85 pounds, and a bursting pressure a little less than twice that. So I hold the trigger down and set the inline regulator(right where the blue hose begins) to 35 pounds, my guesstimated spraying pressure. When I let off the trigger, it climbs back up to the compressor output pressure of 80. So far so good. But when I press the trigger again, as I would to spray the next pass, I have to wait for maybe 5 or more seconds for the pressure to fall back to 35 pounds. That's a lot of wasted dope. Do you have this problem? Do you think maybe it's because the blue fabric hose is swelling under pressure, or maybe just the wide volume of that hose is too much? Maybe that narrow little black hard plastic hose will solve the problem. What do you think, are you having similar pressure problems? I would have tried it, but I had to abort the shop after I fell down on the concrete. I'can't be sure till my x-ray Wednesday, but it feels an awful lot like I've fractured that hip... the other one. The newly (twice-repaired)hip is doing great. I hope your hip is not serious, at least not fractured. Two things you might want to try are having the pressure to the regulator only five or so psi above your air gun's operating pressure. And, see if your air gun is able to spray just air, no paint. This is done by pressing the trigger part way. 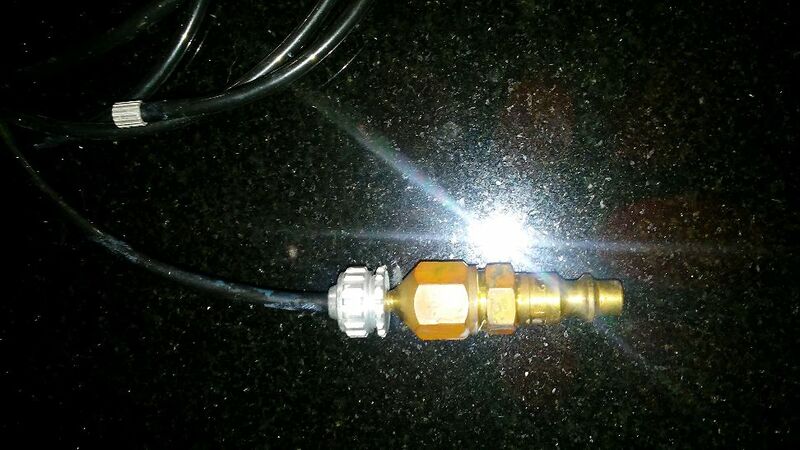 If so, then you can spray just air until all pressures stabilize. When spraying with full size equipment I usually have a constant stream of air and only spray paint as the air gun is getting close to what ever is being painted. Last Saturday evening when a wrench slipped out of my vice and I fell onto the concrete, I just knew I'd fractured my "good" hip, which had been hurting pretty badly for a few days. Then I dumbly posted about it in this thread. It's not busted. I finally got an x-ray today, and it's just arthritis, which hopefully will clear up soon. I goofed. My vivid imagination rarely takes a rest. That can be a good thing, in that the inside of my head is basically a never ending cartoon show, so I keep myself(and others) pretty well entertained. If you ever catch me laughing out of context, that'll probably be why. But other times it possesses me to blab dumb stuff such as the aforementioned example. I must have missed that. I am glad things are not worse. It’s never a bad thing to be hyper aware and don’t feel poorly for posting what you were feeling at the time. No such thing as "dumb stuff" on this forum!! Glad its not as bad as it could have been. Ive had a string of heath setbacks in last few years, saps my strength and is very frustrating. I had to put hobbies aside for more important chores so haven't used the brush yet.